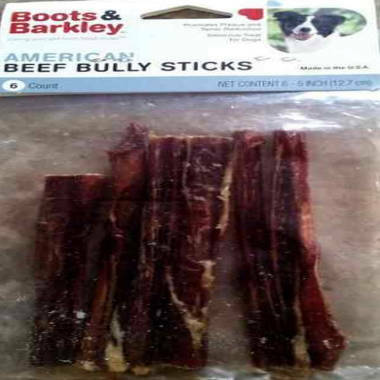 Boots & Barkley 6-count, 5-inch American Beef Bully Sticks have been recalled because the products tested positive for salmonella. A Denver company is recalling packages of its pet treats made from dried bull penises -- known as “bully sticks” -- after they tested positive for salmonella. Kasel Associated Industries launched the voluntary recall after routine testing by the Colorado Department of Agriculture detected the contamination in packs of Boots & Barkley 6-count, 5-inch American Beef Bully Sticks, the company said. The recalled pet treats were sold nationwide at Target retail stores from April through September. The product comes in clear plastic bags containing six bully sticks marked with the bar code number 647263899189. Kasel is recalling all lot numbers after the following lot codes tested positive for salmonella: BESTBY20APR2014DEN, BESTBY01JUN2014DEN, BESTBY23JUN2014DEN, and BESTBY23SEP2014DEN. The bully sticks are made in Denver, a company official told NBC News. Salmonella can sicken animals that eat the products and can infect humans who handle the treats. However, no illnesses linked to the products have been reported in pets or humans, company officials said. Pets with salmonella infections can be lethargic and have diarrhea or bloody diarrhea, fever and vomiting. Some pets will experience decreased appetite, fever and abdominal pain. Infected pets, even if they appear healthy, can transmit the bacteria to other animals and people. In people, salmonella can cause fever, diarrhea and abdominal cramping. Most victims recover without treatment. Some, however, may become ill enough to require hospitalization. Consumers are urged to return the Boots & Barkley products to the place of purchase for a full refund. Bully sticks and so-called “pizzle sticks” are among popular pet products made from bull penises.